Electroencephalography and magnetoencephalography (EEG and MEG) are brain signals with high temporal resolutions and are believed to reflect neural mass action. For modeling the neuronal structures, which are responsible for the generation of EEG/MEG, one can use so-called neural mass models, like the one of Jansen and Rit . In such models, a brain area (e.g. a cortical column) is modeled by two or three neural masses subsuming similar cells, which are characterized by a single input-output relationship. It turns out that this type of model is too simple to reproduce the entire richness of typical EEG spectra. We therefore propose to use neural field models , which take into account the spatial dimension of active brain areas and describe the use of realistic local connectivity information in these models. 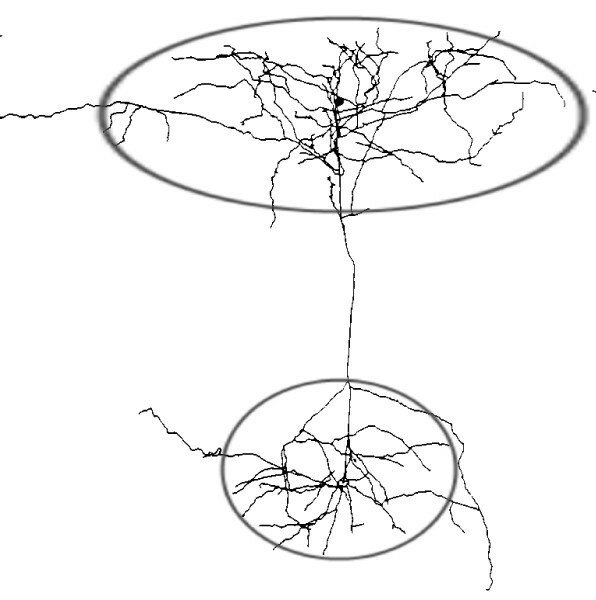 Dendritic and axonal arborizations need to be modeled for a formalized description of the connectivity between neurons and neural masses. The complex structure of these arborizations is represented with the help of trivariate Gaussian distributions (Figure 1). The number of the synaptic contacts will be weighted with the probability of synaptic connection and the gain of average postsynaptic potential. The neural field model is an extension to the neural mass model. The space in the model of the neural field, e.g. a cortical area or the entire cortex, could be defined as a homogeneous continuum of different neural masses with different structural properties. Interactions among neural masses of the neural field model can be described by a system of second order integro-differential equations and an embedded connectivity matrix. In the neural field model, not only the functions (excitatory and inhibitory) but also the morphology (pyramidal and non-pyramidal) of the neurons will be taken into consideration. The neural field model could produce a large variety of EEG-like waveforms and rhythms. In addition, this model is able to generate signals of multiple independent frequencies and spatiotemporal activity pattern (Figure 2). 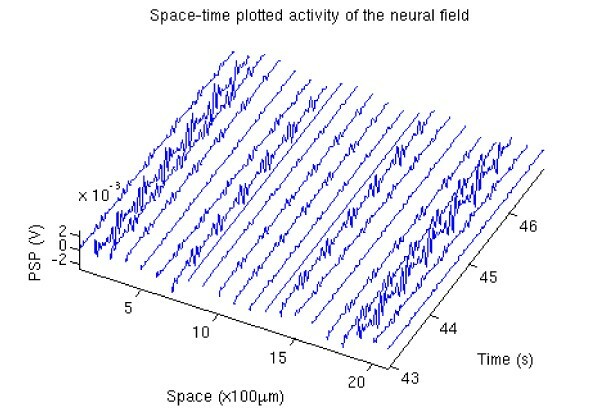 Spatiotemporal activity modeled pattern by the neural field model. We propose a new formalism to model neural fields and describe the incorporation of precise local connectivity information into these models. Our model is capable of producing output with very EEG-like time courses and spectra. Our results might constitute an important step on the road towards a universal model for neuronal mass action.